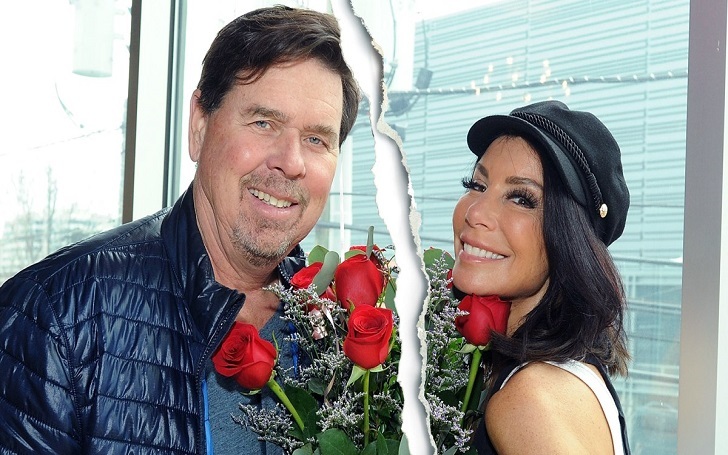 Danielle Staub and Marty Caffrey have officially split! The 'The Real Housewives of New Jersey' star's husband has filed for divorce from her, just after four months of marriage, multiple sources have confirmed. A rep for the television personality exclusively confirmed to media that the divorce complaint has been served. The split comes after Danielle, 56, filed a temporary restraining order against her estranged husband, 66, following an alleged quarrel at her home. He also accused the RHONJ alum of threading “to stab [him] in the neck at least a dozen times” over the past year. Steve Honig, a representative for Danielle, says Marty's filing is “laughable” and “clearly a knee-jerk reaction to Danielle’s filing". The duo married on May 5 in a private ceremony on the Bahamas' North Bimini Island at the Luna Beach Club. Danielle's two adult daughters, Christine, 24, and Jillian, 20, who she shares with ex-husband Thomas Stab, were also present at their wedding.